In my twenty years of travel, I’ve had a lot of cool experiences. When I think back I’ve had the chance to sleep under the stars on a deserted island, I’ve survived 50 degree Celcius heat, I’ve lived in four different countries and I went to Iceland 15 years ago before it was all over Instagram but some of my top experiences in my book are the top wildlife encounters I’ve had. I think back to all the countries I have visited and what I did there I’ve usually planned my trip around seeing a particular animal in the wild there. Monkeys in Thailand, Quetzals in Costa Rica, Gelada Baboons in Ethiopia, Lions in the Serengeti – these animals were the reason I went to these places. True story – I was actually going to name this website ‘My travel wildlife’ so I could capture all of my wildlife adventures. Then I realised how hard it was to actually capture these moments on film. Seriously, I look at Planet Earth with David Attenborough and I think I could do that. Now that I’ve been on 10+ safaris I know how difficult that is and I’m going to leave it to the professionals. I want to sit back and relax and enjoy the show. So here we go. My top wildlife encounters with my photos which really does not do them justice. It’s the ultimate adventure but I was scared to death to do it. It turned out to be one of the most enjoyable and peaceful things I’ve ever done. SHARK CAGE DIVING! It had been on the list before I even started my Africa trip and as the day got closer I was getting more and more anxious about shark cage diving. 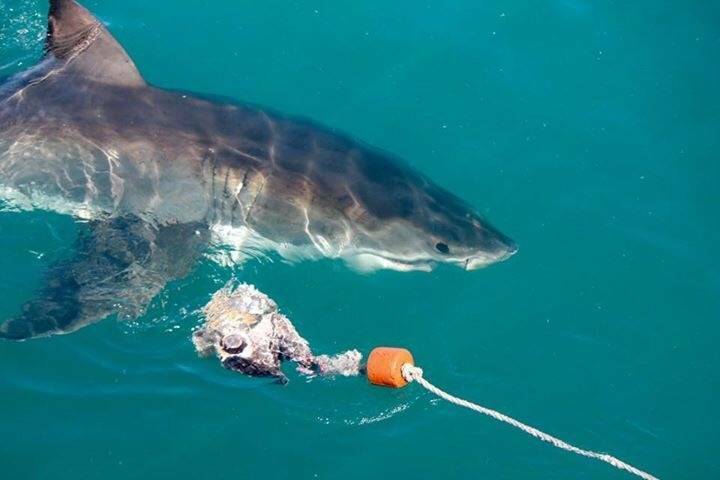 I squirmed every time I thought about climbing into a cage off the coast of South Africa and in the water with Great White Sharks. As I was eating breakfast the morning of I realised I was getting more excited to dive with Great White Sharks. Before I was kind of dreading it, hoping it would get cancelled. There was still a part of me that was saying ‘I don’t have to get into the water if I don’t want to’ or ‘All the best shots will be taken from the boat’. I was trying to reason with myself before that on why I wouldn’t get in the cage but now I was looking forward to it. After our briefing – basically no one can put their arms or legs outside the cage….umm yeah, not a problem – we had a 30 minute boat ride out onto the water where we would anchor and start throwing out the chum which is fish guts and blood to attract the sharks. Now everyone is given a wet suit, boots and a hood and I wish I could say that keeps you warm but I would be lying. It definitely helps but the water is cold – 12 degrees Celsius to be exact. You wait in the cage until your guide tells you to dive down and you just hold your breath and use the bar to pull yourself below the water to see the sharks. Diving with the sharks is an adrenaline rush but I also found it quite a peaceful experience. I always do when I’m underwater as its silent and the sharks swim right past and you look into their giant black eyes. You forget everything you saw on ‘Shark Week’ and are there in awe of what a spectacular species you are looking at who is also looking back at you. I arrived from the main island to Ha’apai which is a direct flight and takes about an hour. Jodi from Ha’apai Beach Resort met me at the ‘airport’ (it’s a small landing strip on the island) and took me straight to the boat where I hopped on for my first day of swimming with humpback whales. We headed out in our snorkelling gear – wetsuit, snorkel, fins. I thought we would have problems finding the whales but honestly that first day there were so many whales it was more of a question of which ones we were going to follow and which ones did we think were going to hang out for a while because believe me they swim fast and there is no way you are going to catch them. The best experience of the day was watching four males showing off to prove who was the dominant one. They were breaching, and blowing bubbles and all around showing off for us. It was amazing to then get in the water with them and watch this. I still remember this gigantic male swimming below our boat and he was belly up so you saw the bright white of his under belly in the deep blue of the ocean. And he was fast. So fast. And then two flicks of the tale and he breached again. It was an amazing experience. We hiked about half an hour into the forest with our tracker. The trackers go out first thing in the morning to find the gorillas and know where they are. They radio the guides and tell them where to go. Once you reach the tracker you must leave all of your stuff except your camera there. I was the first one in following the guide and next thing you know I was face to face with a gorilla. I turned to the guide and was pointing going there’s a gorilla right there and he was like yeah, I know. I was not expecting to be that close by any means. This picture of Kubaka was taken moments before he charged me. Our guide was cutting down some foliage and Kubaka didn’t like him cutting down his food source so he charged us. Can’t say I blame him! Our guide would make sounds like a gorilla to tell them everything is alright. It was amazing to see how fast he could move towards us and watching his face get angry was just as amazing as it was scary. This was a very special experience for us as we were the only two there and we each had our own cheetah. Mine’s name was Susan and Claire’s one was named Lillian and they were both gorgeous. When we first met them they were lying down just chillin’. The cheetahs are different than the lions as they will let you touch them anywhere except the following three places – inside the mouth (like I was going to try?!? ), their front paws, and inside their ears. They were completely fine with us petting the top of their heads and touching their tail. I had Susan purring within minutes. We actually spent a long time interacting with the cheetahs before we took them for a short walk. 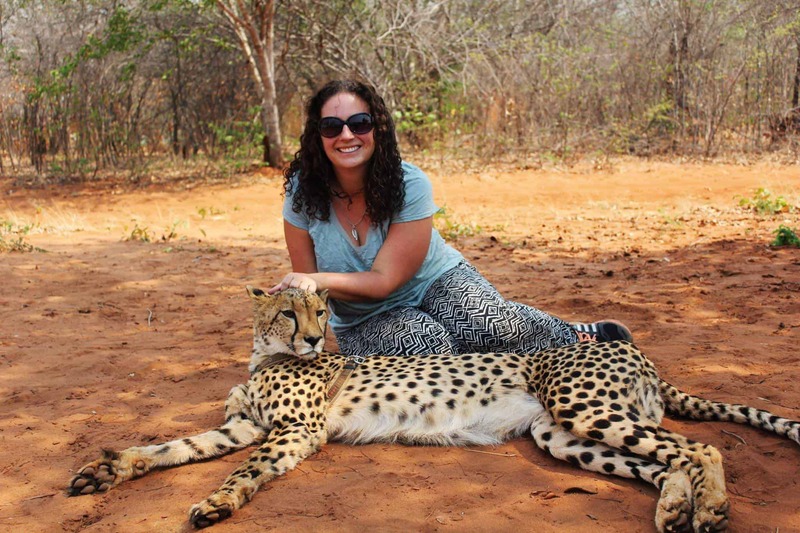 The guide said to us that the schedule is completely up to the cheetahs and their behaviour when we are with them. If they don’t like the interaction we would move onto the walking first. Luckily our cheetahs were very relaxed and actually didn’t want to go for a walk at all. So we went for a very short walk with lots of rest stops. Susan was not impressed with the walking and it always took us a few times to get her going again. If you go to the Maldives and do not get to experience the underwater playground there you are missing out on best feature of the Maldives. While I was there I was able to snorkel the beautiful reefs with Manta Rays, turtles, tropical fish and of course the beautiful whale shark. 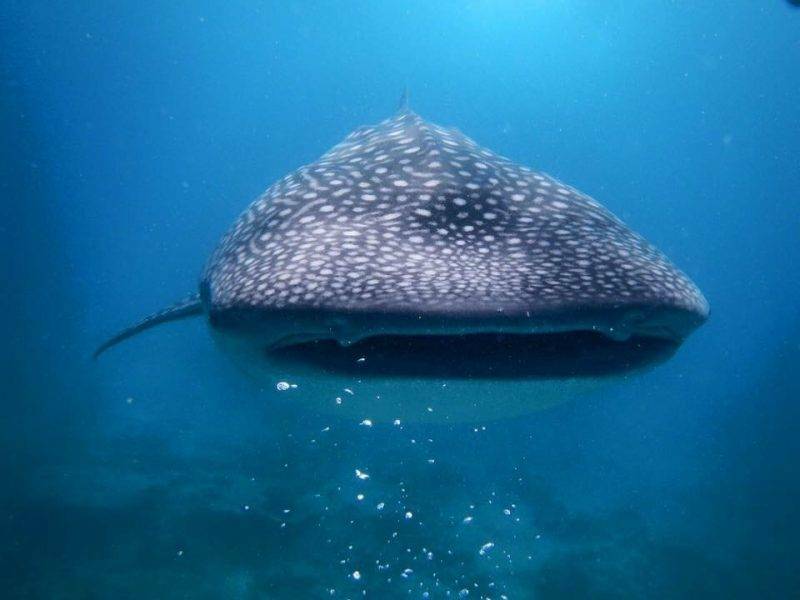 Whale sharks are attracted to the rich plankton filled waters of the Maldives. They do not feed the whale sharks here to attract them which means that you are not guaranteed to see them but it is a lot less touristy as well. I was lucky enough to swim with four different whale sharks while I was there. And what struck me most about them is how elegant and graceful they are along with being fast swimmers. They make it difficult to keep up with them! It was a long day swimming but definitely worth it to see them in their natural habitat. So those are my top wildlife encounters. Over to you. What’s your favourite wildlife encounter? These are some great experiences. We’ve some of them, but not meeting a gorilla face to face. That would be amazing, although kinda scary too. Can’t imagine getting charged. wow.. just wow! I have to admit that none of these encounters are really my thing but I admire and envy folks like you who have the guts to swim with sharks or pet Lions, it must be an unbelievable experience! Oh man. I am really split on stuff like this. On the one hand, I would love to do any of these things. I love animals, and these are all the kinds of encounters that people dream about. That being said, you really have to be careful with stuff like this, because swim-with and other close encounters can be really bad for the animals. Did you feel comfortable with all the tourism companies that took you out in terms of respect for the animals? Wow, these are all amazing wildlife encounters. I love them all, scariest being the shark cage diving and most exciting the cheetah! I cannot wait to encounter a cheetah when we visit South Africa this fall! 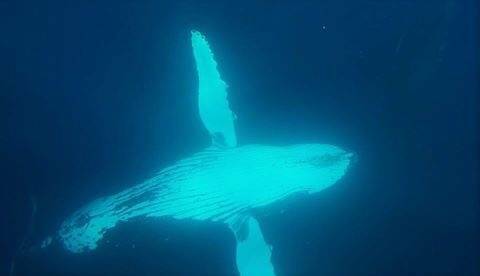 The swimming with humpbacks is so crazy! We have a ton of them in Alaska, but I’ve only seen them breach. I bet they make you feel so small once you’re in the water with them. My top encounter would have to be diving with Octopus in Australia. These are some truly amazing experiences. I especially loved reading about your time with the humpbacks and whale sharks. I would be worried that you couldn’t find them just like you were. That really makes me want to go visit Tonga! i swam with whale sharks in the Philippines but it was kind of a sad experience since they are feeding them. Gonna add Maldives to my list too! Interesting to know you planned to call your site ‘My travel wildlife’. 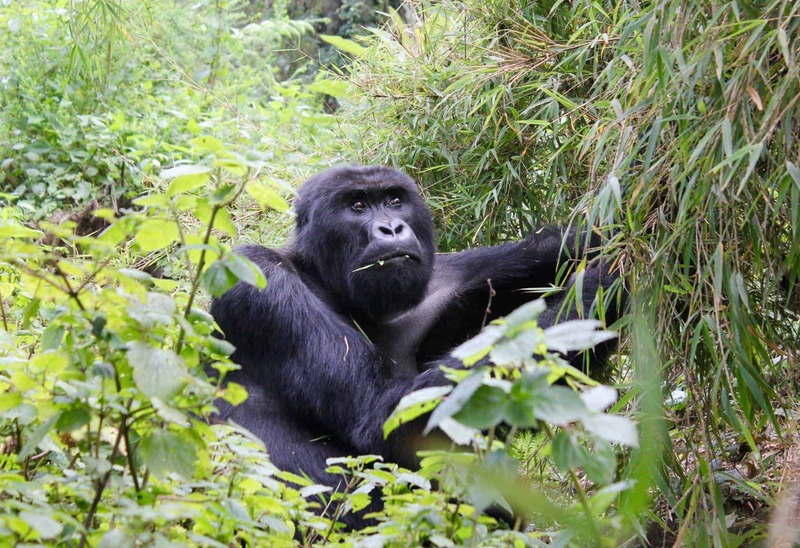 I’m keen to see the gorillas and really handy to know that they scout before you hike around. I would have been terrified when the gorilla became angry! You’ve had some amazing wildlife experiences. Being charged by a gorilla must have been scary. My top wildlife encounters involve going on safari in South Africa where I live and witnessing wonderful wildlife scenes. I am so jealous!!! I love animals, and all of these sound like amazing experiences! I definitely want to go swimming with sharks one day! Oh, after reading your post I got envious of you for your wildlife experiences! You seem to be a female David Attenborough ! Congrats for your rich wildlife experiences ! And, yes, safari in Africa and scuba diving in Maldivi have been calling me for a quite long time already. It sounds like you have had some wonderful experiences. For me, I am a bit divided with animal tourism – if it is something where I can see them in their own habitat and we are not interfering than great, if not however, I do wonder if we should be doing it. It is difficult I know – we recently visited a zoo (I know a contradiction on what I just said) that focuses on rehabilitating animals so for example there was a young monkey there that was actually in detox before his previous owners thought that it was a great idea to get him hooked on alcohol and drugs – it was awful to see but I actually felt that on this occasion a zoo was doing something really worth while to try and eliminate some of the suffering. I do worry about things like spending time with dangerous animals though – how were you able to get quite so close to a cheetah? Whilst a great experience I am not sure it is one for me. Wow! That sounds like adventures! 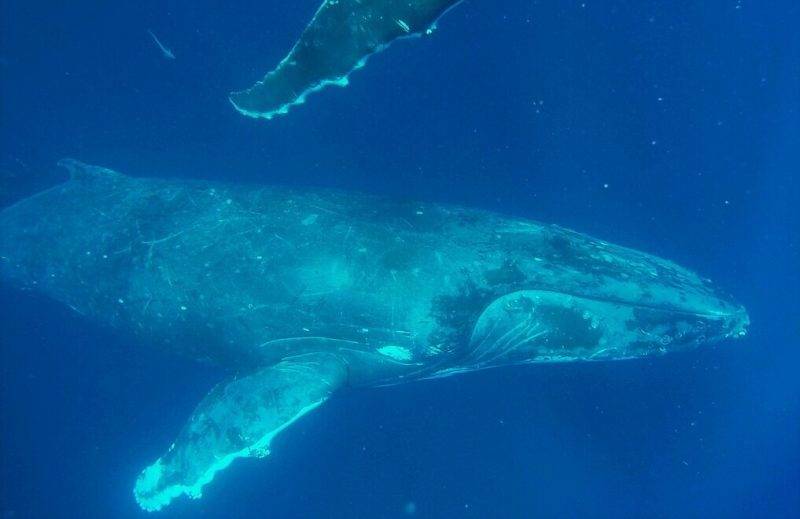 I’d love to go swimming with whales in Tonga that sounds absolutely incredible! Like the perfect day too! Thanks for sharing, your one daring lady! Wow what amazing adventures you have had!! I swam with sharks in Dominican Republic but would love to be this up close and personal to Gorillas! Looks awesome! Incredible photos, what an experience! It’s wonderful to know so many exotic creatures exist in this world and it seems like you’ve hit some of the most magnificent places to see them! Some great experiences! I’ve been lucky enough to snorkel with whale sharks in the Philippines and Mozambique and I’ve definitely had snorkelling with humpbacks on the list for a while. Hope to one day get to Rwanda for the gorilla trek too. Not so keen on the cage diving with great whites though. The greenie in me just doesn’t agree with attracting dangerous wildlife to people with chum and then complaining when sharks come closer to humans and start “attacking” surfers. Oh my goodness! How amazing is your story and all these fun experiences. I’m going on my first safari in a few months and I’m so excited! All of these are amazing, I couldn’t pick a favorite!! I really want to do ALL of them! The only one I’ve done is swim with lemon sharks, but that’s not the same as cave diving with sharks! Ranthambore is on the list! Next time I am India hopefully. I so want to see tigers. OMG!!! These are all amazing experiences – don’t know if I’d like the sharks but everything else is definitely something I need to try now, thanks for this! Wow you’ve had some increible wildlife encounters. Would love to try the gorilla trekking. I’ve done two of these, 3 more to go! Wow, you have experienced so many amazing things! I would love to do all of these things apart from the shark cage diving because sharks terrify me! Incredible encounters indeed! I have swam with nurse sharks and dolphins before in Jamaica and visiting an Owl Cafe in Japan but I have since regretted it due to educating myself on the conditions that some of these animals face. It seems like your encounters were sustainable though! One of my favorites was seeing the snow monkeys in Japan when we were in Kyoto. I’ve not had experiences with any of these animals. The one I’d pick to first is the gorillas, it must be amazing to finally find them after a long walk. You must have been very scared when he charged you, luckily your guide spoke gorilla! You’ve really had some amazing adventures with all these wildlife encounters. I swam with the whale sharks in Cebu but would love to go to the Maldives where they are truly free and not fed. I love the story you had about the humpbacks in Tonga. I’ve always wanted to swim with them, I would imagine that it would be quite nerve racking thinking you might not see them but then to have so many you have to choose, must have been amazing! !